We’d love your help. Let us know what’s wrong with this preview of Rick Steves' Spain 2007 by Rick Steves. To ask other readers questions about Rick Steves' Spain 2007, please sign up. like any modern-day Rick Steves - certainly far above adequate and generally wry if not actually funny, the text seems mostly unchanged from the 2002 version I also happen to own. The hotel and restaurant recommendations are practically worthless to me - in any guidebook, so I barely skimmed those. Where Steves always shines is in the city and museum walking tours, where he (and his co-authors) can weave a narrative through physical space, and make sense of how history shapes place and culture, like any modern-day Rick Steves - certainly far above adequate and generally wry if not actually funny, the text seems mostly unchanged from the 2002 version I also happen to own. The hotel and restaurant recommendations are practically worthless to me - in any guidebook, so I barely skimmed those. Where Steves always shines is in the city and museum walking tours, where he (and his co-authors) can weave a narrative through physical space, and make sense of how history shapes place and culture, all in a concise handful of pages best read torn from their binding and restapled, en-route or in a cafe down the way from the pages' subject. Sadly, the maps in this edition are mostly computer-drafted, lacking the hand drawn --- i.e. physiospatial / mental map / not to scale / sensible hierarchy of information --- quality of Steves' earlier books. For one example, the Alhambra map in Spain 2002 has room labels abbreviated and written directly on the map, whereas the 2017 edition has keyed notes for every room, which a reader has to stop and refer to the key notes, an added step for an addled tourist on the go. The same map suffers from graphic errors not present in the earlier version: Solid walls and the edge of a pool or pavement get the graphic weight, confusing solid and void. I always use Rick Steves' books for european trips, but for future planning I may stick to the older editions. This book was written in the typical Rick Steves fashion with his dry, quirky humor and frugal take on travel. We enjoy his writing and many of his tips are very helpful. His tips on how to get to Tangier and Gibraltar from Tarifa were fantastic. I do wish she would add some of the lesser-known attractions in the big cities. We went to some of the smaller museums to avoid the crowds at the Prado and others and we’re delighted with the selection of paintings and lack of crowds. The Hospital Pau in This book was written in the typical Rick Steves fashion with his dry, quirky humor and frugal take on travel. We enjoy his writing and many of his tips are very helpful. His tips on how to get to Tangier and Gibraltar from Tarifa were fantastic. I do wish she would add some of the lesser-known attractions in the big cities. We went to some of the smaller museums to avoid the crowds at the Prado and others and we’re delighted with the selection of paintings and lack of crowds. The Hospital Pau in Barcelona is not to be missed and it’s not even mentioned in his book. Supplementing his book with recommendations from TripAdvisor makes for a really good trip. I'm a Rick Steves fan and this one was handy for our trip to Spain. My edition was 2014 and it proved a valuable guide when I was visiting in 2015 and 2016. I thought this was a good guide and there was some humor involved which I appreciated. 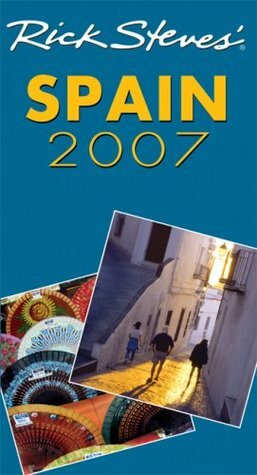 A good guide, that had many helpful tips and helped me plan itineraries for several days on a vacation to Spain. Ironically, we made the most use of the sections on Gibraltar and Tangier... neither of which is in Spain. The guide doesn't make any attempt to cover all of Spain, instead opting for detailed coverage on about a dozen recommended destinations. The coverage of Andalucía, Costa del Sol and Costa Blanca is quite sparse, which made it less than ideal for my trip. I'm sure Rick Steves woul A good guide, that had many helpful tips and helped me plan itineraries for several days on a vacation to Spain. Ironically, we made the most use of the sections on Gibraltar and Tangier... neither of which is in Spain. The guide doesn't make any attempt to cover all of Spain, instead opting for detailed coverage on about a dozen recommended destinations. The coverage of Andalucía, Costa del Sol and Costa Blanca is quite sparse, which made it less than ideal for my trip. I'm sure Rick Steves would be unsympathetic with this criticism, and tell me that I should have used his book to pick better places to visit. But the sections on Granada, Madrid, Gibraltar and Tangier were all informative, very helpful, and worth the cost of the book. I was particularly impressed by the pointers to individual tour guides. In both cases where we chose a guide based on the book's recommendation, the guide was fantastically informative, entertaining, and ebullient. Unfortunately, it seems like the attention from being highlighted in a guide book (or simply from providing excellent service) has led to them expanding their business, and hiring others to work for them. In one case we were lucky enough to get the guide we had booked, but in another we were led by an associate who was only mediocre, and only got to spend a few minutes with the much more entertaining and outgoing guide named in the book. I confess, I don't like Spain at all. I hate the culture, am not fond of the food, and am not even wild over the people or language. This is one of the very few countries in Europe I can say this about (Portugal is another). On the other hand, if one has a relative whose work took him here along with his wife and kids and you want to see them, you have to visit Spain. There are only three things I like about it- getting to visit the Altamira Caves (or at least a replica), visiting museums, and t I confess, I don't like Spain at all. I hate the culture, am not fond of the food, and am not even wild over the people or language. This is one of the very few countries in Europe I can say this about (Portugal is another). On the other hand, if one has a relative whose work took him here along with his wife and kids and you want to see them, you have to visit Spain. There are only three things I like about it- getting to visit the Altamira Caves (or at least a replica), visiting museums, and the fact that you are so close to Morocco, you can pop right in for a visit. Morocco is FAR more interesting and has far better food. The Moroccans do speak Arabic as a first language but they all speak French as a second language which is great for me since I speak French as a second language myself (one of my grandmas was French). Rick covers Morocco in this book which surprised me as this was my first time reading the Spanish guidebook. Morocco is superfriendly! The people are genuinely delighted to have you visit and will go out of their way for you. Some of Rick's suggestions on where to stay in Morocco are fine and acceptable including a couple of my own favorites (unlike most of his where to stay recommendations in his books). He also actually listed my favorite tour guide here as well as a favorite place to eat. He only includes Tangier. I wish he also included Marrakech. I used this to help plan my trip last month to Barcelona and Granada. I've been a fan of Let's Go and Lonely Planet travel guides and have preferred to use those in my past trips. However, I was impressed and I appreciated the level of detail Rick includes in these guides. Suggestions on what to eat, people who are helpful, walking tours of neighborhoods and even guides for some museums (thank goodness for his guide of the Museu Picasso! It helped a lot!) were really helpful. However, there were I used this to help plan my trip last month to Barcelona and Granada. I've been a fan of Let's Go and Lonely Planet travel guides and have preferred to use those in my past trips. However, I was impressed and I appreciated the level of detail Rick includes in these guides. Suggestions on what to eat, people who are helpful, walking tours of neighborhoods and even guides for some museums (thank goodness for his guide of the Museu Picasso! It helped a lot!) were really helpful. However, there were some limitations: he focused on his recommended neighborhoods, but if you were staying elsewhere, you wouldn't have a clue what to do. His maps are atrociously designed. They're supposed to look handmade and quirky, but I found them useless and opted to always look at my separately bought laminated pocket map. I can't stand maps that are useless, so that bothered me quite a bit. Rick Steves' guides are the best. If only they were smaller. But then they might not be so informative: where to go, how to get there, how much it costs and even opinions as to whether one should bother! I did a terrible thing for a librarian. I bought an older copy and tore out relevant pages, took them with me, recycled that book and retained the 2010 for notes when I got home. I still miss the Michelin green guides for their size and succinct historical accounts. But if I had to choose now I'd Rick Steves' guides are the best. If only they were smaller. But then they might not be so informative: where to go, how to get there, how much it costs and even opinions as to whether one should bother! I did a terrible thing for a librarian. I bought an older copy and tore out relevant pages, took them with me, recycled that book and retained the 2010 for notes when I got home. Always an invaluable tool for our trips to Europe. Although I don't always agree with everything written, these books are very helpful and have great step by step maps and descriptions of the major things to see. I also rely heavily on Frommer's, Fodor's, and Trip Advisor to create my own Itinerary. I end up with a perfectly customized trip that caters to our interests. Time consuming but worth every minute. The RS videos are also excellent. Rick Steve's guidebook helped us navigate a two week driving tour of Spain. We hit all the highlights; Barcelona, Granada, Sevilla, Cordova, Toledo and Madrid. Informations on sights to see, history, art, and even parking was always helpful. This book did not cover the Coast well as he is more interested in historical and more tourist oriented areas, Best books for information on European travel. I read the 2010 version. This book was excellent preparation for our trip to Spain. Great hotel recommendations and things to see. Wasn't a huge fan of the restaurant recommendations. But it was quite helpful for all things travel paired with all things Spain, and even included some personal tours, which saved us some money in the end. I just love Rick Steves. He's funny while at the same time packing a lot of history and very useful information into his travel guides. We used his books for our trip to Italy and just knew we had to have one for our trip to Spain. We caught ourselves mentally thanking him several times for the tips! Highly recommended if you're heading to Europe. There's a reason Rick Steves is the king of European guidebooks. He really knows how to explain facts in a light, amusing yet authoritative voice - he seems to know every destination like the back of his hand. Very helpful for our trip to Barcelona, Toledo, Madrid, Sevilla and Cordoba - advice was spot on. So much better in book form than on Kindle. I used the Kindle versions for Scandinavia and Italy but the book is so much more useful. You simply need to flip back and forth between pages and maps and the Kindle version just doesn't do that well. Use this book combined with Trip Adviser rankings to find the good stuff. A Rick Steve's book will make any travel experience better. He tells you an overview if the country or cities top sights and a bit about the history. Be careful with his maps though they are good to get a general overview but are not good for navigation. Walking tours of the Alhambra were better in his book than the 10€ headsets you could purchase at the ticket booth. This book was just as great as Rick's other publications - full of practical info as well as tons of cultural & historical tidbits. I will say that I don't always agree w/ his restaurant recommendations, but overall this is a terrific publication for hitting Spain's best tourist destinations! This book is very informative. It provides you with any Do's and Don't, in addition to things one must do while in Spain. I love Rick's books, but you must check out his website. The two together make an awesome parring/ supportive measure. He was very condescending to the Camino de Santiago pilgrims. He kept referring to them as the backpackers and telling the reader to ignore them, stay away from them. He called them smelly. Even if it's true, he could still be nice. Indispensable, though it was stolen in Spain. Most helpful were the off-the-path restaurant reviews and the general tips (e.g. make your stuff as hard to steal as possible). I impressed my co-travelers with some of his restaurant guides - that were also on the cheap. 20150720 ◊ The Rick Stevesiness of books by Rick Steves never fails to annoy me after awhile, but the info is consistently solid. This book did the trick, and I'd recommend it to other travelers, along with several large grains of salt. As usual Rick proves to be a great source of advice and information for anyone traveling to Europe. Although his directions to things are sometimes not so clear and what he says you can see in one day always takes us three. I love Rick Steves' travel guides. His writing style is comfortable, he gives excellent travel tips, and he offers the must-see spots as well as hidden gems. I always download a walking tour if he has one available or photocopy one from his book. Spain, here we come! Richard "Rick" Steves is an American author and television personality on European travel. He is the host of a public television series, and a public radio travel show, and the author of many travel guidebooks and autobiographies.